The Ruth Eckerd Hall Experience is getting bigger and better. Over the past few years, as part of our Expanding the Experience $34 Million Capital Campaign, our members and patrons have helped us successfully renovate the Capitol Theatre - a beloved Downtown Clearwater landmark, the Murray Theatre - the crown jewel of our Education program and the Margarete Heye Great Room - an elegant space where life’s special moments can be celebrated. For more information on what to expect when you arrive during your next visit to Ruth Eckerd Hall, please click here. Please click the red button below to view our video tour of Expanding the Experience. Please help us fulfill our mission. Donate to the Expanding the Experience Capital Campaign today. Description: We are making physical and aesthetic improvements to the roadway leading from McMullen Booth Road to Ruth Eckerd Hall, and changes to our main parking lot. Benefit: Two lanes will be added to our roadway approach to expedite patrons’ arrival and departure experiences. A thoughtfully revised traffic pattern will enable patrons to pull directly into our parking lot without having to drive around the building. New signage, lighting and landscaping along the roadway will create a sense of anticipation upon arrival that something special is about to happen. Description: The north façade of our venue will be torn down so that we may expand our current 1,000 square-foot lobby to a 6,000 square-foot grand lobby with floor-to-ceiling glass walls that will provide panoramic views of pre-show activity and amenities from the new outdoor arrival plaza. This will give our venue a sleek, modern look consistent with the building’s other recent exterior renovations (entrances to the Murray Theatre and administration offices) and Frank Lloyd Wright-inspired original design. Benefit: Expanding our grand lobby will transform the look of our building from its dated 35-year-old appearance to a modern, forward-looking venue that reflects the cutting edge of our industry on which we operate. We book the latest and greatest acts in entertainment, and provide more performing arts education than any other area local arts organization while using the latest evidence-based approaches, like arts-integration curricula and experiential learning. We think the new design of our grand lobby and main entrance reflect the forward thinking that propels all aspects of our organization. Description: At 6,000 square-feet, our new grand lobby will be six times the size of the old lobby and will include expanded food and beverage service; the Holt Family Stage in the Kate Tiedemann and Ellen Cotton Cabaret Theatre; sound dampening light pendants that are as functional as they are stylish; and a video wall for displaying the performance on the main stage and messages about upcoming shows and education activities. ; and plenty of space for patrons to stay awhile upon their arrival, so that they may enjoy the grand lobby’s new amenities. 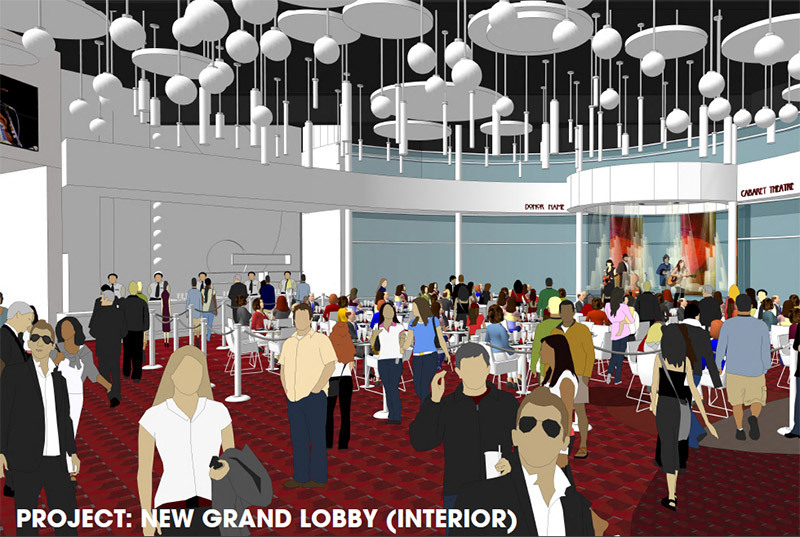 Benefit: The reimagining of our grand lobby (renovation seems like an understatement) will provide patrons with an array of new amenities that will enhance their entertainment experience. 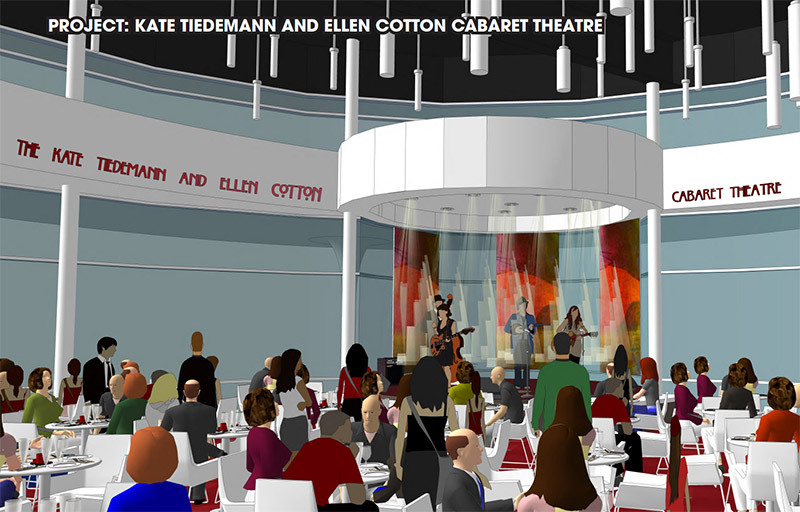 The Kate Tiedemann and Ellen Cotton Cabaret Theatre will provide enhanced food and beverage service, including pre-show meals. A video wall will simulcast performances on the main stage, enabling patrons who step out into the lobby for refreshments or the restroom mid-show to continue experiencing the performance. (Marketing messages on the video wall about upcoming performances and education activities will help keep patrons engaged with Ruth Eckerd Hall’s activities that mean the most to them.) Our new spacious grand lobby will accommodate large crowds of patrons without them ever feeling crowded, providing a state-of-the art gathering place and entertainment experience patrons expect from the region’s premier performing arts venue. 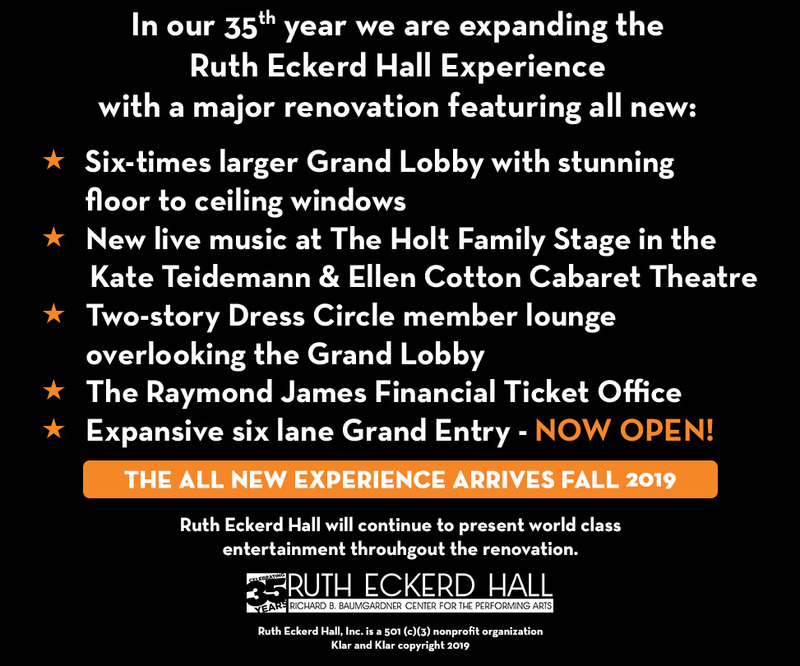 Description: The Kate Tiedemann and Ellen Cotton Cabaret Theatre will be a new pre-show performance venue for students in Ruth Eckerd Hall’s education programs. Technical students (sound and lighting) will collaborate with student performers (singers, musicians, etc.) to stage live performances before approximately 150 main stage shows annually. Pre-show meals will be served in the theatre, which may be rented by the community for use on dates when there are no shows scheduled at Ruth Eckerd Hall. 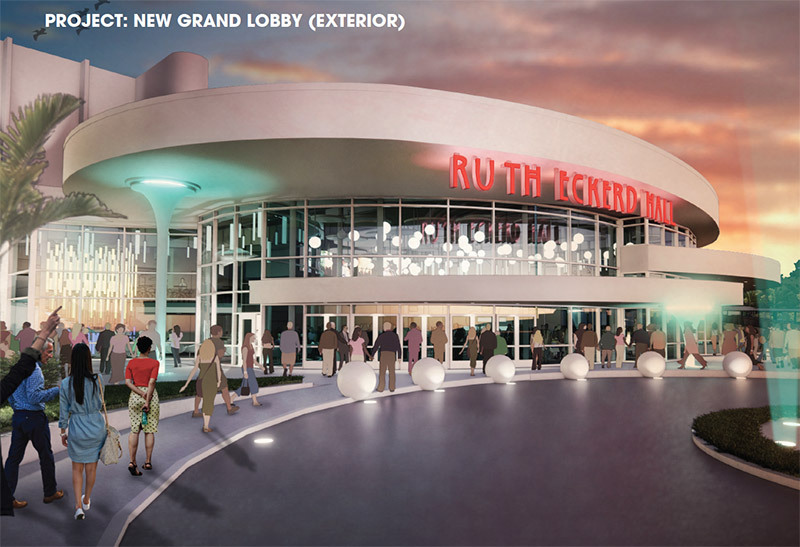 Benefit: Ruth Eckerd Hall’s patrons, students and the community in general will benefit from the Kate Tiedemann and Ellen Cotton Cabaret Theatre. Students will gain invaluable experience staging shows and performing for a ticket-buying public. The theatre will be an extension of our education programs and provide experiential learning in a world-class setting. Patrons will benefit by having additional pre-show entertainment and dining options, and the community in general will benefit by renting the theatre for meetings and special events. Description: We will be doubling the size of our Dress Circle Lounge for Circle of Stars members, giving it a modern makeover and locating it adjacent to the new grand lobby, affording patrons views of pre-show activity. A second bar will be added so that members may enjoy their complimentary beverages and hors d’oeuvres upstairs or downstairs. The lounge will feature a custom-made colored glass sculpture of major campaign donors who helped make the renovations to Ruth Eckerd Hall a reality. Benefit: Our members will experience a new level of pre-show hospitality by having access to twice as many amenities as they currently enjoy in a much larger space. Doubling the size of the Dress Circle Lounge will enable members to comfortably visit with their parties, and mingle with other guests without being shoulder-to-shoulder. 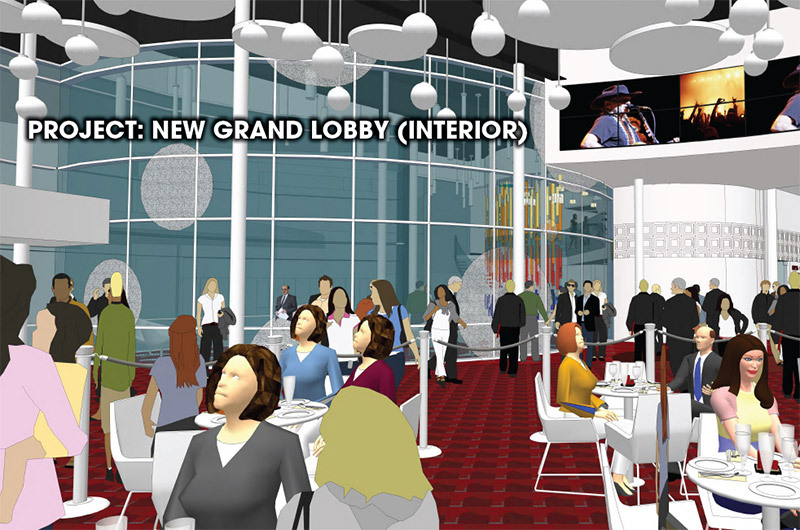 The downstairs level of the Dress Circle Lounge will have floor-to-ceiling glass walls that provide views into the new grand lobby and pre-show entertainment on the Holt Family Stage in the Kate Tiedemann and Ellen Cotton Cabaret Theatre. Description: The Raymond James Financial Ticket Office will be renovated to include overhead protection from the elements. Benefit: Our patrons will have it made in the shade while engaging in transactions at the Raymond James Financial Ticket Office. A substantial overhang, designed to mirror the ones at the entrances to the Murray Theatre and Ruth Eckerd Hall’s administrative offices, will provide protection from sun and rain. Description: Ruth Eckerd Hall is presenting more shows than ever before, and drawing the largest crowds in the history of our organization. Our new arrival plaza will be expanded to accommodate the corresponding increase in vehicles at our venue, and will feature new landscaping and a signature sculpture for visual interest. Benefit: Patrons will have more room to drop off members of their party, avail themselves to valet parking or temporarily park their cars on non-show days while purchasing tickets at the Raymond James Financial Ticket office. Pre-show activities in our newly redesigned grand lobby will help set the stage for the world-class performances that occur on our main stage throughout the year. 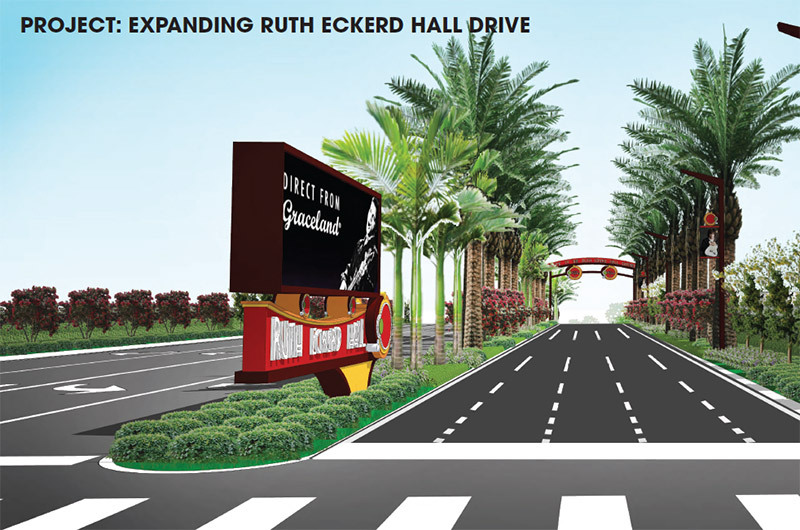 Ruth Eckerd Hall is Expanding! Get an inside look at the construction updates happening inside and outside of Ruth Eckerd Hall. 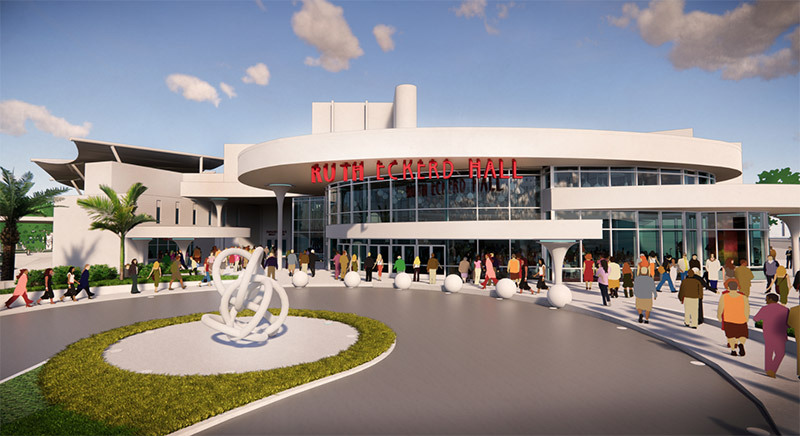 The all new Ruth Eckerd Hall Experience, coming Fall 2019.